Ideal for RF applications including outdoor TV antennas, cable television and satellite distribution. Ideal for RF applications like outdoor TV antennas and cable televisionRG6/U Dual Shield is ideal for antenna, cable television and satellite installations. This cable is 18AWG copper clad steel center conductor surrounded by a foam polyethylene dielectric. A bonded aluminum foil and 60% aluminum braid provide 100% shield coverage. Use for CL1, CL2, CM, CMX and CMG installations. Swept tested to 3GHz to ensure performance at applicable frequencies. To help you keep track of cable used, the cable jacket is sequentially marked every two feet. Ideal for high-frequency applications including cable television and satellite distribution. 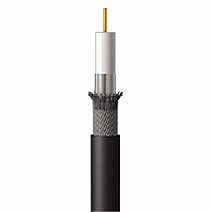 Ideal for RF applications like outdoor TV antennas and cable televisionRG6/U Quad Shield is ideal for antenna, cable television and satellite installations. This cable is 18AWG copper clad steel center conductor surrounded by a foam polyethylene dielectric. A bonded aluminum foil and 60% aluminum braid over another foil and 40% aluminum braid provide 100% shield coverage. Use for CL1, CL2, CM, CMX and CMG installations. Swept tested to 3GHz to ensure performance at applicable frequencies. To help you keep track of cable used, the cable jacket is sequentially marked every two feet. Dual construction saves installation time; great for dual LNB satellite installations! 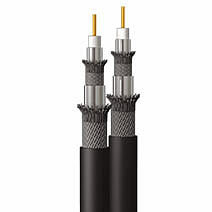 Dual RG6/U Quad Shield is ideal for antenna, cable television and satellite installations. Make two cable runs at one time for dual LNB satellite or satellite and antenna installations. This cable is 18AWG copper clad steel center conductor surrounded by a foam polyethylene dielectric. A bonded aluminum foil and 60% aluminum braid over another foil and 40% aluminum braid provide 100% shield coverage. 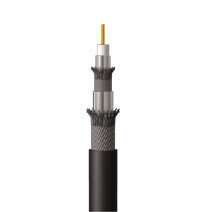 This cable meets specifications for CL1, CL2, CM, CMX and CMG installations. Swept tested to 3GHz to ensure performance at applicable frequencies. To help you keep track of cable used, the cable jacket is sequentially marked every two feet.